Big Game Fishing is just a sea sport of trolling. It’s a perfect tour for enjoying with whole family. Cruise for enjoying the big catch by hand line fishing from Chalong pier. Go to Racha Yai by vessel equipped with all materials of trolling to catch King Mackerel, Sailfish, Black Marlin and Wahoo around. Go to another warm fishing point after your on board lunch. Back to your hotel with big catch memories. We will pick up you early in the morning from your hotel and transfer to Chalong pier. 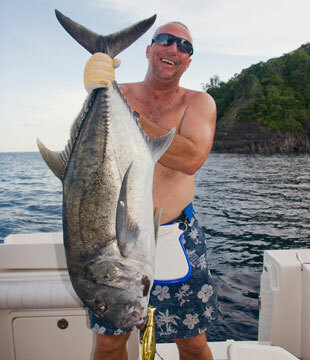 Get on Big Game Fishing vessel and head to the south of Phuket towards Racha Yai. During the cruise, get a detailed overview and training on the Penn and Shimano trolling equipment. Find the fishing ground spot of warm water for big ones and feed them in a frenzy. After baiting, start trolling. Get shouted with the big catch and be greedy for more. Get the name for each one from our guide. Lunch time will knock you and have your delicious on board lunch. Take rest for a while. Look for another warm point and continue your trolling. Don’t feel bothered because you will hopefully get more than before. However, enjoy the day and you will back to Phuket with many ‘Big Catch’ captured memories. 9.00 Depart from Chalong Bay. 12.00 – 13.00 Lunch served aboard and time for swimming. 13.00 – 14.00 Bottom fishing. 16.00 – 16.30 Arrive back at Chalong Bay. 17.00 Transfer back to your hotel. Children who like the joy of the fishing experience have to pay the full Trip price. The reduced price only applies for children or adults which just like to join the trip but not wish to actually be part of the fishing experience.